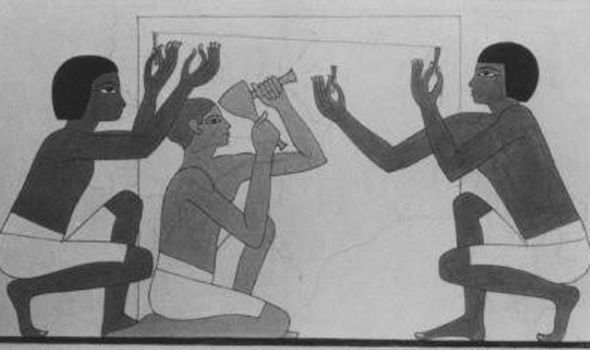 This was one of the techniques used by ancient people including the Egyptians, using pin wedges. Yep, saw that..... but you are wrong! Aliens cut the big stones in ancient times! I found this vid to be oddly satisfying... I've seen this done before in documentaries but it was really neat to hear the stone cracking. they have shown water and gear powered saws at Egyptian sites with left over cut rocks. Then again, the laser precision cut stones at Puma-Punku alsomake one wonder. Yep Len. Thems aliens Ags referred to found the dust storms in Egypt too serious so they went across the Atlantic and did Puma-Punku and then on to Machu Pichu. Then the weekend came around so they went home for it (their weekends are 5000 years long!). Very interesting, plus I learnt something new about sound. I don't know if you are serious Tim, but I think our technology and way of thinking about modern technology is way behind ancient times. @Stargate wrote: Very interesting, plus I learnt something new about sound. How is our technology behind ancient times??? I think past intelligentsia was way ahead of today's technology. We take it for granted that because we have electricity, and electric tools we are more advanced than past cultures. Most of modern technology is coming from the past. Star, could you please give specific examples? @Agartha wrote: Star, could you please give specific examples? We hardly create anything totally new, we just modify old ideas, I think all knowledge comes from experience, it has to be passed up or down. Look up a man called "Credo Mutwa" he can explain that even what we are calling modern science was already on planet earth, and plunged the society into darkness when it failed. Robots and technology are not new, that is how a lot of people got here. Sorry, but there is no evidence of any ancient civilization that had robots and no evidence of modern science before us. Unless somebody can show me the evidence, it's all speculation. Well, I understand your point of view, because if you have no evidence there is no proof. However I have certain facts to my disposal that I can use to come to some conclusion, although they may not be accurate they contains some fractional part of logic. Lets say matter is what we know, or it's a given. Our body as we know it, is made up of limitations. One of these hurdles is, we have to move mass, which dictates it's own limits. If I cross the limit, in terms of moving too much mass, over my body weight, i will have to find a method to move the excessive weight. I have to create a technology to overcome the obstacle. The ancient Egyptians had to have a technology to build these giant pyramids, now that we modern humans have discovered them. In the thoughts of our so called modern civilization, and with all these tools we think we have created, we are puzzled by the precision of the work done by the past civilization measured on the tools we know today. It is evident that the Egyptians were not missing the modern tools of today. I do agree with you though, if there is no physical proof of the actual technology they used, we are left to speculate what did they use to create this work that baffles us. Nice topic. You may not agree with me, because this is my view. I do not have physical evidence, logic and time have joined forces and this is what I came up with. But the tools that they used are commonly known... they left behind examples, they wrote about them, explained how they were used. The tools the Egyptians used to build the pyramids are not a mystery. They were very basic and requiring much skill and labour... I have no doubt they'd pick our tools for labour saving, not necessarily because they provide better results. Ancient technology was not ahead of ours, it was simply applied relentlessly and cleverly. I don't agree with you but that's ok, we are all different and discussions are good! Only those who want to find something 'out of this world' are pullzed by the precision of the work. Ancient people didn't have our tools but they had their own tricks: loooots of time and looooots of cheap/ free labour. Nowadays we would build a pyramid with lots of modern machines, very few people and probably in less than a year. The ancient Egyptians used small tools, hundreds of thousands of slaves and cheap labourers and it took them centuries!!! Even Puma Punku (that Len mentioned) has been explained rationally. I agree with most of what you said Kaere, we have no perfection on anything. I suspect the ancient Egyptians would have called their technology modern at the time. There is also an egoistic need for denial on the part of modern science that such precision was not present at the time. I think that time is a factor here. I am sure we are not saying that past civilizations were, or could not be more advanced than at present. Things come together and fall apart. There are lots of evidence that the speed of our present development is going against the normal development as we know them. This would indicate that some of the developments are passed down by some superior intelligence. I am not sure how much of the truth is hidden away from us. Ags, I am not sure what kind of tools they had, I can say modern science is still saying today that they would not be able with the technology used today accomplish much of the work and precision achieved by some of the past civilizations. Ags,I am also not sure about lots of time and cheap labor at that time, I also do not know of modern science building a pyramid anything like the ancients Egyptians. I would have to see this to believe it. @Stargate wrote: Ags, I am not sure what kind of tools they had, I can say modern science is still saying today that they would not be able with the technology used today accomplish much of the work and precision achieved by some of the past civilizations. This is what they used. There are hieroglyphs showing the workers using them. It's all been recorded by the ancient Egyptians. Experiments have been done using them. They paid and housed their workers, there is archeological evidence of these 'mini-cities' next to the building sites, payroll records have been found, accounting ledgers, assignments, names of people in the work groups and leaders... none of it is a mystery. Again I have to agree with a lot of what you are saying K, however we are boasting of being technologically advance although some of our tools are still primitive. I know the ancestors have left a hell of a lot of information that we use, and can use, but a lot of it is hidden for reasons known and unknown. it would be interesting to know how much we are guessing and how much we really know. This is a very interesting point you bring up, why would someone destroy the ancient history? why did someone knock of the noses and damage the lips of statures of our ancient past? In all probabilities of imagination, the small tools we are looking at could not build a pyramid in a trillion years. @Stargate wrote: This is a very interesting point you bring up, why would someone destroy the ancient history? why did someone knock of the noses and damage the lips of statures of our ancient past? Again, not a mystery. The riots and burning of Alexandria is well documented. Political and religious conflict... here's a page on Hypatia, a female scholar who was said to have fanned the flames and was murdered for it. @Stargate wrote: In all probabilities of imagination, the small tools we are looking at could not build a pyramid in a trillion years. Yes they could and yes they did. then I have to say they were greater than I knew. I would have to see that K, Modern science would have to literally convince me by building one and use the same tools.